Culture in Motion was a two day cartographical attempt to reveal a small fraction of the rich and complex patchwork of culture, development and international affairs and to explore and facilitate a continuation of ideas and actions that contribute to cultural development particularly as it affects everyday life. Three sessions were held: Culture and Economics, Cultural Heritage: Preservation & / or Tourism, and Cultural Development methodoloty/Policy. 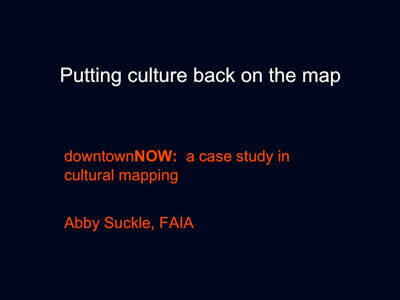 Abby Suckle presented DowntownNOW: a case study in cultural mapping.